My response was that it’s absolutely possible to draw a line to revenue. However, if your only goal is to increase top-line revenue more efficiently with content marketing (i.e., a cheaper investment) than through traditional advertising, you’re missing out on the greater benefits content marketing can offer. Give us permission and budget to create content, and we’ll produce awesome stuff that will be more successful than advertising at driving top-of-the-funnel results. Interestingly, these promises typically work. Sort of. In fact, even CMI’s new 2017 B2B Benchmarks, Budgets, and Trends research points to things looking up for content marketing: 62% of marketers surveyed say that they are more successful now than they were last year. But gains made in the early days of these programs can be deceptive because, in many cases, they mark the first time the company has delivered valuable content to its easiest-to-reach audiences. But soon those audiences will become harder to reach and more demanding (and discerning) when it comes to content they consider valuable. As the content marketing operation matures, it becomes more challenging to find new ways to amp up the impact while keeping up with the increasing demand for higher-quality content. Unfortunately, most such programs eventually reach their breaking point – if they haven’t already. To compensate for flagging results, many companies seem to feel obliged to publish content more rapidly, at higher volumes, and on more and more digital channels all at once. Unfortunately, organizations that set their sights on pumping out “more-more-faster-faster” rarely put systems and strategies in place to enable all those pieces of content to function as strategic business assets. We’ve been too successful in simply making the case for content. Now we need to make the case for slowing ourselves down so we can get better at it. The value of content is defined in terms of the assets themselves: Here, the business views content marketing solely as the practice of producing a different kind of sales/marketing collateral, which it can use to fuel its direct-marketing campaigns. Thus, the business assumes that “doing content marketing correctly” means hiring some content creators who deliver materials to brand managers, demand generation teams, or sales teams, who then use it as a new way to get “attention” from prospective consumers.This speaks to the heart of the Faustian bargain and the ever-increasing pressure to meet the demand for content. And while most do, indeed, become moderately successful at pumping out good content, they fail to invest in building anything of lasting value. They simply put in more effort without enabling the returns from those efforts to scale in tandem. Eventually when the well runs dry, they get stuck in an even deeper hole that they’ve dug for themselves, with no plan for how to climb out. At that point, when the business rightly asks, “Why should we invest in more depth? Can’t everyone just start doing more of this kind of content?” or “Can’t we simply outsource this need?” the only solution is to just keep on digging. Content is solely viewed as a more efficient means to a sale: Here, the business believes that the value of content marketing lies in how much more efficient (or effective, in some cases) it is in turning a prospect into a lead or sales opportunity. This is the straight line to revenue that the above-mentioned CMO was so desperately in search of. But here’s the thing: Content may, in fact, be more efficient or effective at closing or attracting new leads. But then again, it might not. The scary truth is that content marketing done well can turn out to be more expensive than advertising or less efficient than a cold call; it can even slow progress through the stages of the brand-consumer relationship. Put simply: Content marketing is often no faster, cheaper, or more effective at moving customers down the funnel than other marketing techniques. However, its greater power lies in its ability to produce a better customer, a more loyal customer, or a customer more willing to share his or her story with others – which compounds the value he or she provides to the business. But when we simply stop the business case at how much more can we squeeze out of the marketing process, we overlook this important potential. Over six years of deep explorations into our industry’s evolving landscape, CMI has found that the greatest potential for content marketing success lies in viewing content as a strategic business activity that just happens to be performed by marketers, rather than as a marketing and advertising tactic that gets applied for the express purpose of reproducing incremental wins or amplifying upper-funnel marketing results. As we’ve said for years, content marketing isn’t a replacement for other forms of marketing – it just makes those forms work better. How? Content marketing adds value to the business by building a critical strategic asset: a subscribed audience. Put plainly – content marketing is a different kind of investment for marketing, as it offers the potential to provide multiple lines of business value simultaneously. Strategic content creation helps build an engaged audience of people who exhibit specific, desirable behaviors – like greater willingness to share personal data, greater interest in upselling opportunities, and greater brand loyalty and evangelism. When your content compels your audience to adopt these behaviors, not only does it become easier for your business to achieve its long-term marketing goals, it can also open up new business opportunities – and even new revenue streams. It’s not so much that top-of-the-funnel activities should alter the purpose of content, but rather that content should be strategically designed to add a valuable dimension to all your marketing initiatives by contributing a new form and functionality. 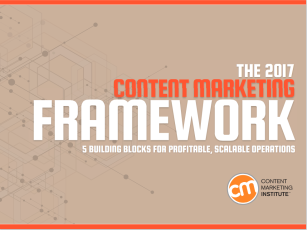 It’s been three years since we unveiled the Content Marketing Framework. At the time, its purpose was to serve as a high-level view of the principles that govern the world of brand storytelling. Since then, CMI has worked with more than 100 brands, helping them put these core principles into practice. Those partnerships taught us a lot about which parts of the framework worked, which didn’t, and where we still needed to provide greater clarity and transparency. To better reflect the insights I discussed above – as well as the many shifts that have occurred across the digital ecosystem – we’ve streamlined our original discussion and have added a distinct new process model to each node. Taken as one cohesive unit, this framework unifies the methodology we teach at CMI University. It is our hope that each of the five nodes serves as a trigger point that helps you understand how to grow stronger, more agile, and more innovative in your approach to creating content that builds value for your customers, as well as for your business. Instead of continuing to pursue your path of potentially diminishing returns, why not take a step back, rebuild the case for content marketing in your enterprise, and then move forward with a much stronger potential to reach your business goals through content? Are you ready? Then let’s get started by checking out the 2017 Content Marketing Framework. Want more on content strategy for marketers? Sign up for our Content Strategy for Marketers weekly email newsletter, which features exclusive insights from CMI Chief Content Adviser Robert Rose. If you’re like many other marketers we meet, you’ll come to look forward to his thoughts every Saturday.